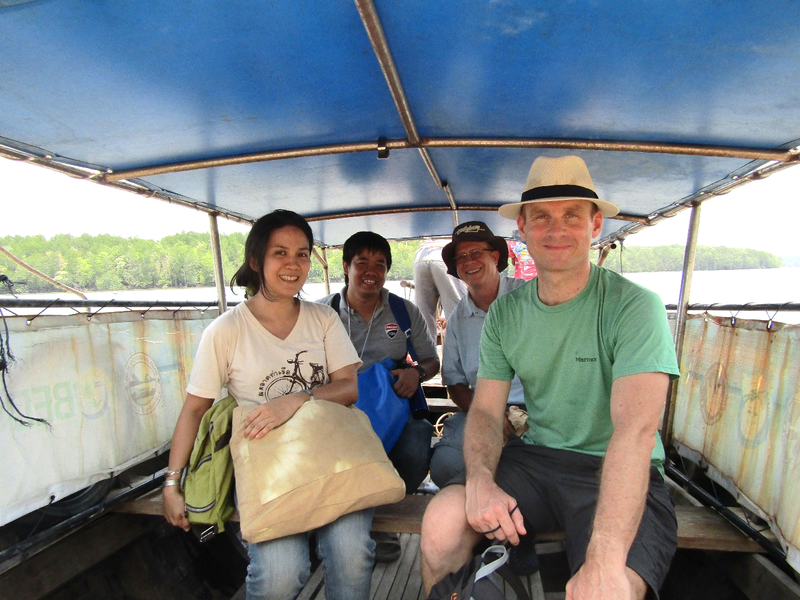 A visitor from one of MAP's funders, Synchronicity Earth, based in London UK, came to Thailand to see and learn first-hand about mangrove restoration! From March 29th to 31st MAP Asia had the great pleasure to receive Jim Pettiward, communications strategist, at Synchronicity Earth a funder and collaborator of MAP since 2014. This is the first time MAP Asia has received a visitor from Synchronicity Earth. “It’s much more interesting and valuable to see and experience projects on the ground rather than just read reports, if you want to really understand the issues” stated Jim. 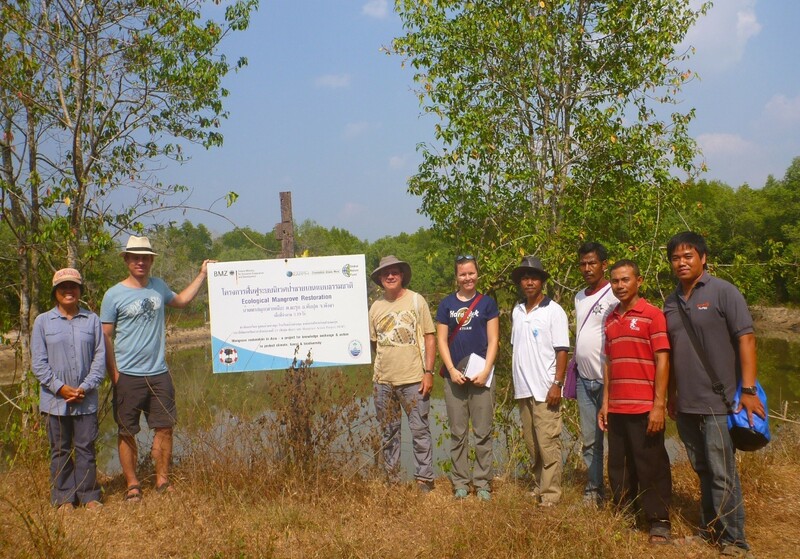 MAP Asia staff had the occasion to show Jim Pettiward around six mangrove restoration sites utilizing the Community-based Ecological Mangrove Restoration (CBEMR) method within the provinces of Krabi and Phang Nga, Southern Thailand. The local community representatives at different sites were available allowing us to exchange information and ask questions directly to the villagers concerned with the mangrove restoration projects. 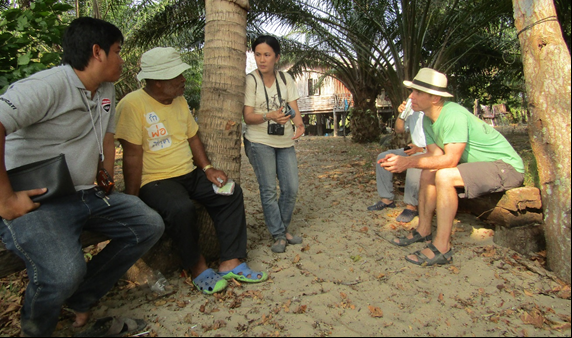 Informal exchange of information with Bang Non Mee Lam, local conservation leader of Klang Island, Krabi. On the first evening after welcoming Jim to Krabi Town with a taste of the delicious Thai food, a powerpoint summary presentation was given on the 4 year "Mangrove Restoration and Reforestation in Asia, a Project for Knowledge Exchange and Action to Reduce Climate Change, and Protect Forest Biodiversity” project. This regional project was administered by the Global Nature Fund (GNF) of Germany and MAP’s projects were co-funded by Synchronicity Earth. On the second day, we visited four of MAP's mangrove restoration sites in Krabi Province: one site at Ban Lang Da started in 2009 and three other sites on Klang Island. The Klong Lu homestay, a GNF project partner, was used as our base on the island and a longtail boat driven by the owner, Bang Bao and his 10 year-old son transported us from the mainland and toured us through the mangroves on route to the family bungalow operation. While motoring along the Krabi River we were welcomed by a playful pod of Indo Pacific hump-backed dolphins which did a great job of putting on a show for Jim's birthday! The Klong Lu homestay is involved in eco-tourism and with MAP's support, has developed a short interpretative mangrove nature trail around the mangrove restoration site which was initiated just 6 month ago. The small loop walkway will be a great tool to educate visitors of the Klong Lu Homestay, daytrip visitors to the island, along with school kids from the local area. 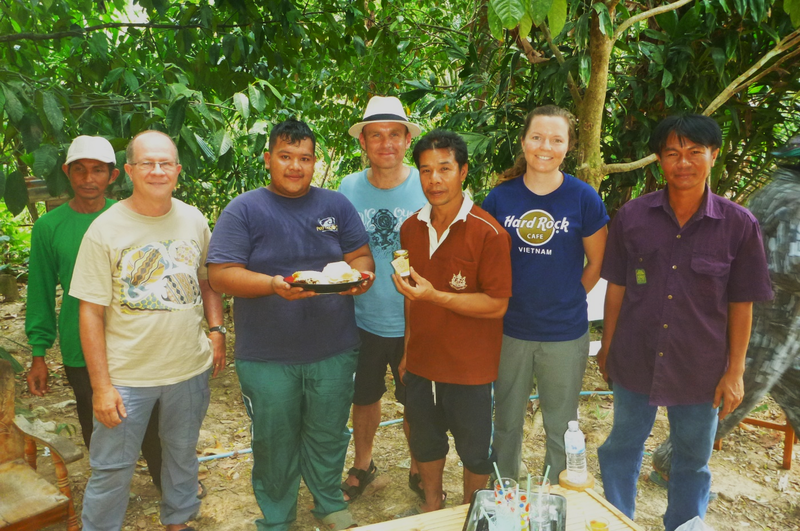 The final day, was highlighted by a visit to the Nai Nang's apiculture group, in Krabi Province. This community has been successfully producing honey partly from mangrove flowers and are, now, also creating value added products such as honey hand soap, shampoo and conditioner with the support of MAP. During our time there, community conservation leaders showed us how they harvest the honey from the hand-made bee boxes. We even got a taste of the freshly collected honey, YUMMY! After wild honey tasting we headed north to the restoration site in Ta-Sanook village, Phang Nga province where the village chief and some members of the conservation group showed us the ongoing construction of their new mangrove nature trail which plans to be completed by May 2016. It will allow local school kids to learn about mangrove ecosystems first-hand without getting their feet wet. The field trip was a great way to showcase some of MAP's mangrove restoration project with full involvement of local communities who are pursuing supplementary livelihoods supported by the project. It also allowed us all to exchange ideas and get valuable advice and impressions from Jim Pettiward of Synchronicity Earth and key community leaders.